The 2011 Hickory Groundhog and Egg Shoot at Vale, NC was a big success. Some 177 shooters vied for over $7,000 worth of prizes. The main course of fire was challenging, with three sets of paper groundhog targets at 100, 300, and 500 yards, and NO Sighters. Shooters can also compete in an Egg Shoot for cash and other prizes. For the primary three-yardage Groundhog match, there are two rifle classes: Custom Division and Factory Division. The match, one of the most popular varmint competitions in the country, is sponsored by Bulls-Eye Sporting Goods (Larry Willis, owner). The event is held every year on the first Saturday in April. This year’s “Top Shot” at the Hickory was Randy Chappell. Shooting a 6 BRDX (we were told), Randy scored 90 points to win the Custom Division. Randy took home a new Nightforce NXS scope plus $300.00. Runner-up Robbie Roberts steered his 6BR to second place in Custom, earning him a Sightron Scope and $150.00 in cash. Finishing third in Custom Division was past Hickory winner Chris Brady, Terry Brady’s son. Chris, who also shot a 6BR, took home a Shehane Tracker stock and $50.00. There were some surprises this year in the Factory Division. While many folks expected a Savage 6BR or 6.5-284 to win, that wasn’t in the cards. This year a semi-auto ‘Black Rifle’ outshot all the factory bolt guns. Greg Davis scored 72 points with his .223 Rem Rock River AR15 to win the Factory division by a comfortable margin. The next best Factory shooters, Jeff Godfrey and Jason Elmore, both had identical 59-point totals. Godfrey was awarded second place over Elmore on a tie-breaker. The 6 BRDX — The Best BR Improved Yet? Share the post "2011 Hickory Groundhog Shoot Match Report"
Hornady has discovered social networking. 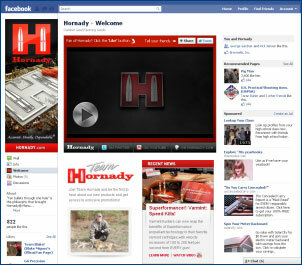 This week Hornady launched official Facebook and Twitter sites. Fans can go to Facebook.com/hornady and Twitter.com/teamhornady to get the latest news about Hornady products and events. Live chats with industry experts. Timely info on new products. Product photo galleries and videos. On Hornady’s new social media pages, shooters can share their photos and stories about hunting, competitive shooting, and reloading. Importantly, the Facebook Page will allow shooters to interact with Hornady’s “brain trust” — the ballisticians, designers, and engineers who develop Hornady’s new products. Allowing customers to share their ideas/experiences with the folks who design and build Hornady products is a good thing. Hornady can get reliable, immediate feedback on its products. That should speed up the process of making improvements and enhancements. Share the post "Hornady Launches Facebook and Twitter Sites"